By Jack Scales: Age and time eventually catching up with us are two inevitabilities we are faced with in this life. However, one man who has continued to evade this fact, is none other than Philadelphia’s treasured son, Bernard ‘The Executioner’ Hopkins. For years, critics, fighters and trainers alike, have predicted his fall from the upper echelons of the sport, but as every boxing fan knows he has constantly proven his doubters wrong, whilst simultaneously defying common trends in human biology. Throughout his 40s, he has systematically broken down a vast number of much younger fighters who were touted to finally put an end to his illustrious career. Despite the best efforts of these young pretenders, at 48, B-Hop remains a major force in the Light Heavyweight division, and on Saturday night he will again challenge for a world title. This time, it will be against the IBF belt holder, Tavoris Cloud. Judging on Bernard’s performance against Chad Dawson, perhaps father time is finally catching up on the slick veteran, but as history has shown us, his opponents should count him out at their own peril. In their current states, it is difficult to dispute the fact that Tavoris Cloud possesses substantially more power than Hopkins. In actuality, Bernard has never been a great puncher at light heavy. However, what he is blessed with, is a degree of ringmanship and finesse that has appeared to escape a vast proportion of today’s fighters. To be blunt, he has probably forgotten more about boxing than most of his recent opponents will ever know. This extensive knowledge of the sport, coupled with his continued dedication to training and healthy eating, has enabled him to compete at the highest level, regardless of the odds. As far as Saturday’s bout is concerned, I suspect either an ugly contest where b-hop just spoils Cloud’s work, or an amazing spectacle where he yet again proves why he is ‘the poster child for taking care of yourself after 40.’ A claim he made in their most recent pre-fight press conference. Additionally, what I can say with great certainty, is that from the sound of the opening bell, Tavoris will immediately fight at a high tempo, which he has done for the most part of his career. As a consequence, he may even score an early knockdown against Hopkins, just as Jean Pascal managed to do. With that being said, as the fight progresses the old warhorse’s guile will begin to show, allowing him to drag the younger man into the trenches, testing his fighting spirit. 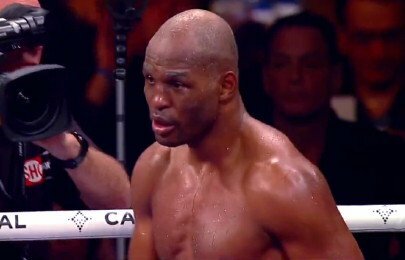 No matter the outcome, this fight will go the distance because at this stage of his career, I extremely doubt that Hopkins has the necessary power required to stop Cloud. Similarly, while the younger man is a vicious puncher, much better men than himself have attempted to stop Bernard and each of them have failed miserably. For these reasons, I believe it is safe to assume that both champion and challenger will end the fight on their feet, but because the 48 year old legend is such an enigma, it is difficult to predict who will win this fight. B-Hop has boldly informed the boxing world ‘You will have reason to be surprised on March 9th.’ I for one hope that is true, but we will have to wait until tomorrow to see whether this old warrior is correct. Previous boxing news: Unbeaten Heavyweight Giant Lucas Browne: Will He Be The First Man To Stop James Toney?